Nine students from MS were given the opportunity to participate in the St Petersburg Science Festival last Friday as Jr. Scientists for the day. They worked with groups like NOAA, US Geological Survey, USF and St Petersburg Water Resource Department, to mention a few. Our students helped scientists explain concepts to visiting schools. They had a great time and did a great job. Below you will find a presentation with photos as well as some comments from a few students that participated. 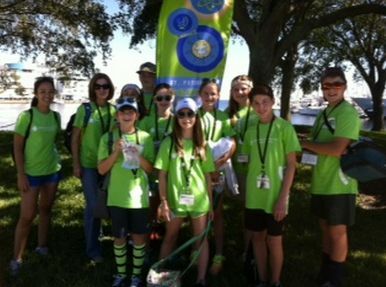 ​Julia C. (6th grade): My experience being a Jr. Scientists was incredible. I loved being able to learn about the station I was helping at. I would love to go there again and help out. I liked staying at the same station because you get to know the people and learn a lot about that. If they have it next year, I will definitely want to go. It was so much fun. Jaydon H: Helping scientists show their work was a great experience. I enjoyed it, and I would definitely go again. The booth where scientists demonstrated how to make slime was my favorite. Henry D: I had a great time at the science festival this past Friday. I got to help out with kids and learn a little too. Our station was about marine life and how they can be overfished making it harder for the fish to reproduce and keep the species from dying out. We met with lots of different schools and helped kids to learn about how to help marine life. We all had a great time!